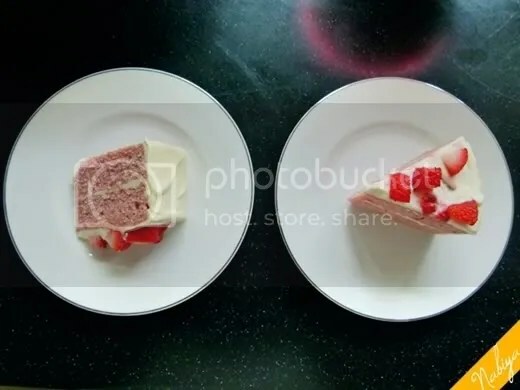 I came across a picture of a slice of strawberry cake while scrolling down my Tumblr feed last week, a basic vanilla cake with a layer of whip cream and fresh, plump looking strawberries in the middle. 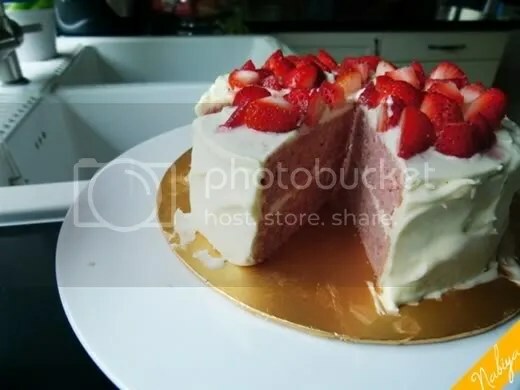 Made my mouth water, and I then proceeded to google strawberry cake. 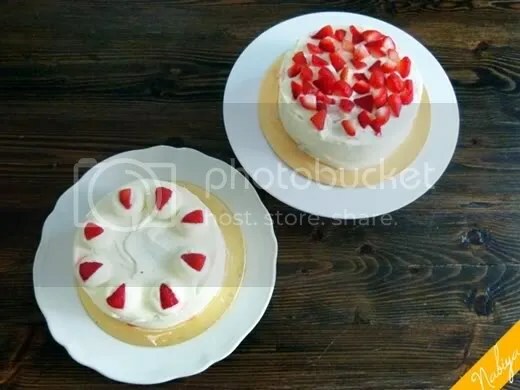 I can’t believe I have never actually eaten a real strawberry cake before! So I scoured the internet for a recipe that sounded appealing. 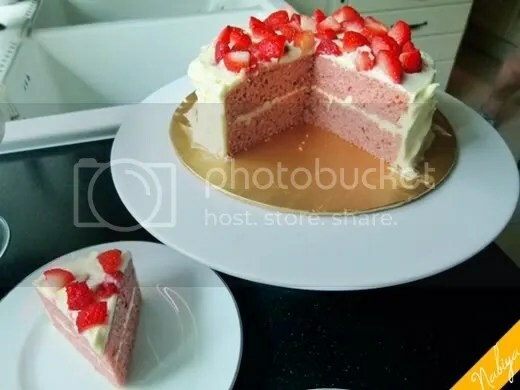 Too many strawberry cake recipes involve using cake mix and/or strawberry gelatin, and I just wanted a fresh cake made from scratch. Finally found one by Kate, over at A Dash of Sass (seriously, go look through this blog, I love her entries!) and it looked easy enough. The only problem is the price of fresh strawberries in Malaysia. 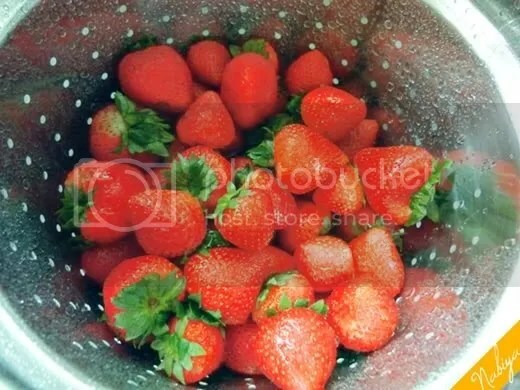 For good, sweet, juicy strawberries, I had to pay out of my nose. You can substitute fresh strawberries for frozen ones, but I don’t recommend using canned fruit for this. The syrup from the canned fruit will muck up the balance of sweetness in the recipe. Prepare the cream cheese frosting (recipe below); frost as desired and refrigerate until ready to serve. Slowly add the sugar in 1 cup batches until desired sweetness is achieved. You may need less than 3 cups if you like your frosting less sweet. Stir in vanilla. Add milk slowly if you need a looser consistency. The result was the softest, freshest cake I have yet tasted… and when paired with that luscious tangy, and almost sweet cream cheese frosting it’s just a really, really good cake. Trust me, this is one recipe you want to learn and have under your belt. It’s easy to whip up, it tastes amazing and that lovely pink will not fail to impress. Give it a shot, and I hope you enjoyed it as much as I have. Posting this entry is now making me crave the taste, so despite the fact that it’s midnight… I’m going to head downstairs and get myself a slice of this cake. I’ll have to run an extra half hour tomorrow, but it’ll be worth it! Thank you, Kate, for this AMAZING recipe!